News of another price cut by the redoubtable duo of Michael White and Peter Thomson at Ocean Independence as the 28.5m motor yacht Anthea has a €900,000 reduction. 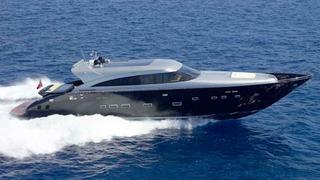 _Anthea _ is a high-performance superyacht built by AB Yachts in 2006. With her Kevlar-Aramat hull, she has enormous power and presence, reaching a maximum speed of 53 knots and cruising speed of 45 knots powered by three 1825 HP Caterpillar engines. Her impressive light interior décor designed by Guido De Groot includes one saloon on the main deck and one on the lower deck. Her accommodation for up to nine guests consists of a four luxurious double cabin layout with ensuite facilities and two separate crew quarters. The new asking price is €2.9 million.